Continuing with the asanas to help reduce the menstrual issue, here is another asana. Veerasana comes from Sanskrit word. Veera means Hero or warrior and hence Veerasana is Hero’s or warrior pose. It is very useful pose for relaxing the body both physically and mentally. It strengthens and stretches thighs, knees, ankles and feet. 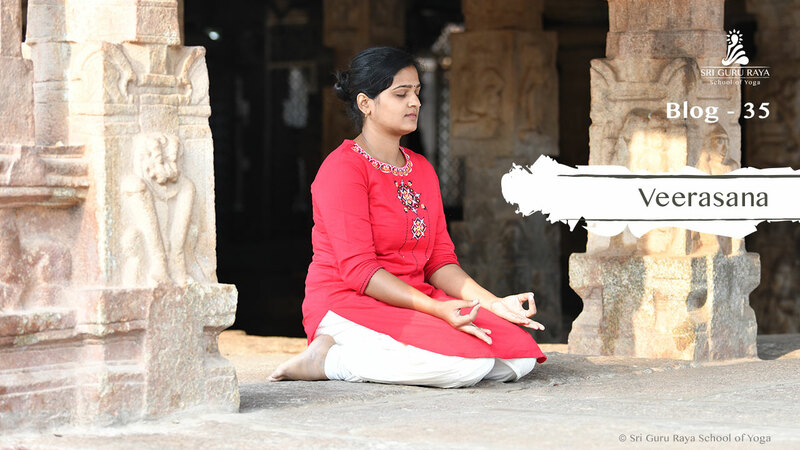 Veerasana can be used an alternate pose for meditation and deep thinking. Veerasana improves blood circulation in legs. Beneficial in Gastric related problems. During pregnancy it helps to reduce the swelling of the legs. Balances the mind and improves concentration. First, assume the Vajrasana pose. This is the starting pose for performing Veerasana. Vajrasana is the simple kneeling pose. Sit on the floor or the yoga mat with legs stretched in front of you with the hands on the side. Then fold the legs one by one and place it under the buttocks. Place your hands on top of thighs just near to knees, your palms should be facing down. During the process, assume that you are the Hero or Warrior, who sits tall and proud. Hold this pose for 30 to 60 seconds. After that relieve your feet, ankles and knees and relax. Don’t perform this asana in case of ankle or knee injury. If anyone has Arthritis, Spinal disorders, Osteoarthritis, High BP, Respiratory diseases or any heart disease. Always perform Yogic activities under the supervision of experts.